This frothing pitcher is becoming more standard in places that don’t specialize solely in beans. Made of stainless steel material. 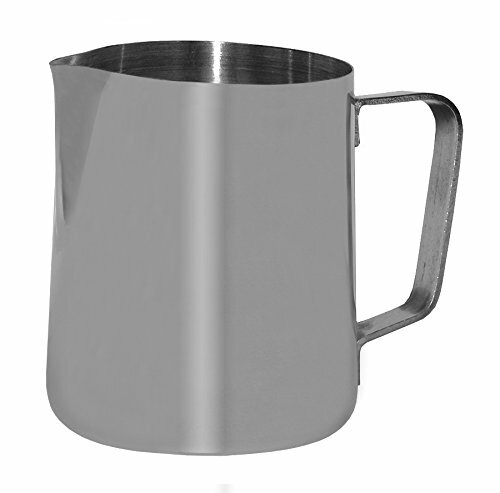 This frothing pitcher is use for steam milk for cappuccino and lattes. The frothing pitcher is handy item for new varieties of coffee drinks. The frothing pitcher feature is a molded pouring spout and a sturdy handle. Comes with 50-ounce capacity. Measures 6-1/2-Inch height. Materials: 201 Stainless Steel,Dimensions: 5 inch Dia x 6.5 inch H.